As the story goes indie music icon Martin Mills signed this new south-east London quartet to Rough Trade Records after hearing just one track from the band. 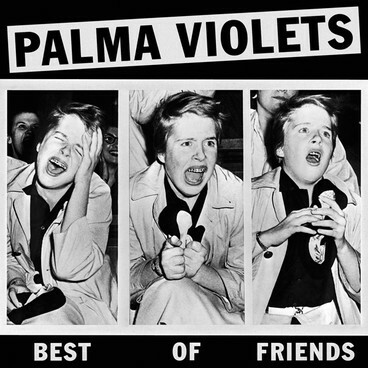 If that’s not enough intrigue for you Palma Violets were recently included in the Guardian ‘New Band Of The Day’ and NME ‘Radar Tip of The Day’ features. Adding to all this, the band are already being labeled as “the saviours of indie rock” and “the hottest new guitar band”. That’s quite a lot of hype and a lot to live up to for a band who quite literally only have two songs online and formed only a matter of months ago. “Best of Friends” is the band’s first single and it’s one part garage-rock and one part indie-rock calling to mind The Cribs mixed with The Libertines but perhaps less melodic. The song is as immediate as you’d expect a first single to be – in fact “Best of Friends” has all the makings of an indie anthem with vocalist/guitarist Sam Fryera shouting out his lungs and sounding like Joe Strummer incarnate. It’s a well-crafted and catchy number aided a lot by its raw and energetic production, which has a live urgency to it. If this is any indication of the band’s live show, Palma Violets are definitely one to watch. Their set up is a simple drum, bass and single guitar formation with the subtle addition of synths courtesy of keyboardist Pete Mayhew adding some warmth and texture against the brittle and jangly guitars and crashing drums. The bass of Chilli Jesson is also high up in the mix with every picked note being nuanced giving a punk-rock edge. The single (with B-side ‘Last Of The Summer Wine’) will be released on October 22 via Rough Trade. However, you can also purchase the single via iTunes now.